The year 1999 was a pretty interesting one. The world was still coming to grips with the internet, Britney Spears burst onto the world stage (and the world listened), and everything—from TVs to music players—was seemingly coated in that weird Y2K Millennium silver. 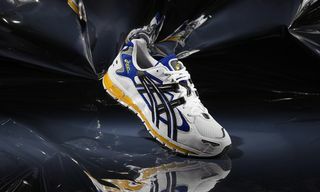 It was also the year that ASICS’s GEL-KAYANO 5 dropped—and, thankfully, it wasn’t coated in that ubiquitous silver. Instead, its colorway was a gorgeous white with royal blue and rich golden pops. The silhouette: a gloriously chunky The fifth iteration of designer Toshikazu Kayano’s ultimate running shoe (the first from the series was released in 1993), he based his iconic design on human anatomy. Now, ASICS are re-releasing the GEL-KAYANO 5 again for 2018 (and you can get it here). 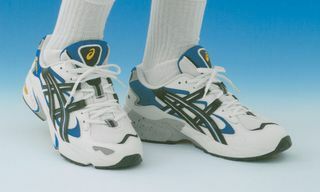 Before the KAYANO 5, the emphasis was on aesthetics, or, in other words, the mood, feel, or emotional aspects of the KAYANO range came first. Then, with the KAYANO 5, we see more importance on technology, and technology made visible. The big feature is its Duomax sole which, combined with ASICS GEL tech in the midsole, combined to create a hardwearing running sneaker. The fact that GEL was double visible in the midsole, with tonal ASICS branding and a teardrop tongue kept that visual ingredient, but now you had a sneaker that was the best one of the range for runners. 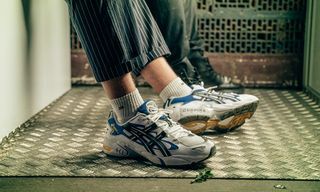 It’s for these twin reasons that the ASICS GEL-KAYANO 5 is arguably one of the best sneakers of the era—and maybe ever created by ASICS. As their deliberately old-school ads say, with a GEL-KAYANO 5: if you know, you know. We couldn’t agree more. 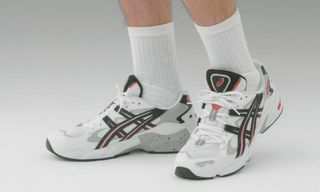 Cop ASICS’s re-released slice of ’99 at ASICSTIGER.com and the best sneaker retailers globally.